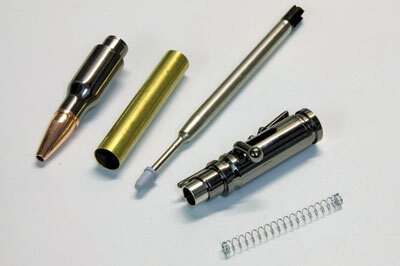 These pen kits are the latest in a range of bullet cartridge related pen kits from Penn State Industries (PSI) and they will appeal to the same hunting, fishing and shooting enthusiasts as the others in the range. In addition to a bullet form, the pen sports a rifle shaped clip and an action similar to a bolt action rifle. The kit comes in two plating variations, chrome or gunmetal, both being to the high quality standard that we have come to expect from modern pen kits. 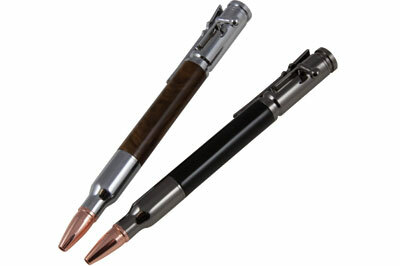 The 'bolt action' mechanism works smoothly and positively and the finished pen feels weighty and robust in the hand. From the point of view of the pen maker this is one of the simplest kits to make up, requiring the turning of only one straight barrel. The tip and clip/mechanism components come fully assembled and ready to press together. PSI do supply bushings for this kit, but as these were not supplied for the purposes of the test I turned them between centres, measuring the fit with a digital calliper. If you use this method I recommend measuring the fit directly from the components rather than using the nominal bushing size as the components tested measured 11.99mm slightly over the nominal 11.83mm. A couple of tenths of a millimetre is scarcely visible but will be sufficient to spoil the smooth feel of the fit. These kits lend themselves to highly figured timbers or burrs to reflect the materials used in gunstocks. 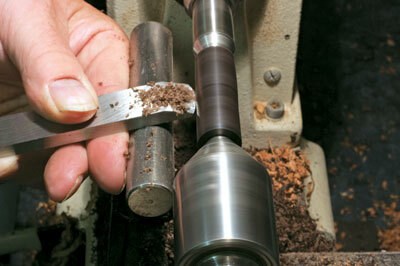 The review examples are made up in figured cross-cut walnut (Juglans regia) for the chrome model and African blackwood (Dalbergia melanoxylon) for the gun metal version.